I explained to everyone there, several who hadn’t seen the new catalogue yet, that I’m so excited with the new stamp sets, that they were the features in the cards we were going to make. I just love these soft colours! 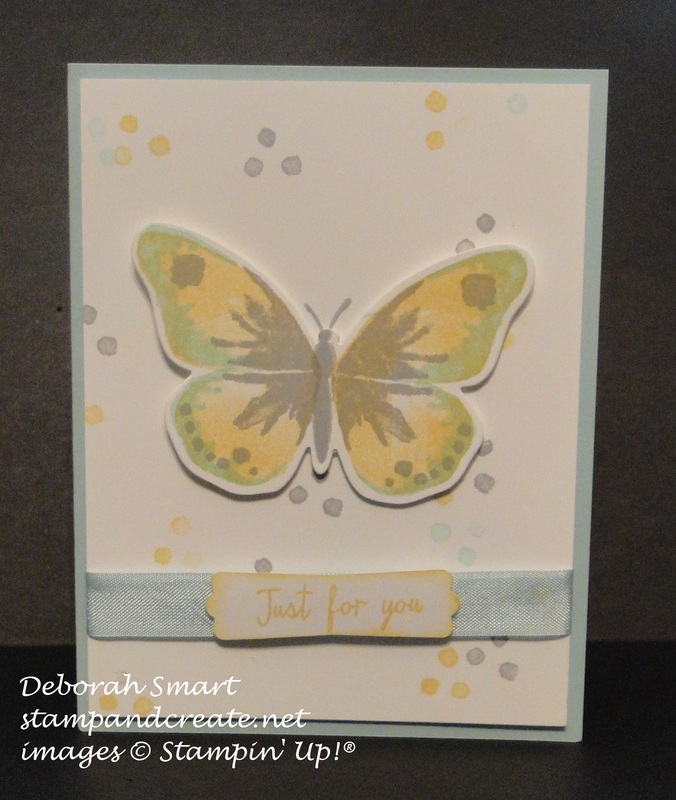 We started by stamping the base image of the butterfly in So Saffron onto Whisper White cardstock. The next layer, which is the outer edge of the wings, is stamped in Pool Party ink, then the inside details stamped in Smoky Slate ink. Do you notice how the Pool Party (blue) stamped on top of the So Saffron (yellow) creates a unique green? Talk about happy accident – I think it looks gorgeous! The butterfly is cut using the Big Shot and the Bold Butterfly Thinlits; after die cutting, we then stamped the butterfly body in Smoky Slate. On the Whisper White panel, we stamped the triple dot image from this same set repeatedly in the same three ink colours; So Saffron, Pool Party and Smoky Slate. Then, before attaching the butterfly, we positioned it where we wanted it, then pulled it down slightly, stamped the antenna in Smoky Slate onto the Whisper White panel, then attached the butterfly with a Stampin’ Dimensional. The sentiment was stamped in So Saffron ink on a small piece of Whisper White cardstock, then punched out using the now retired Modern Label punch, then the edges sponged using a Sponge Dauber (thank you June for letting us use your dauber, as I forgot mine at home!) and So Saffron ink. The retired Pool Party ribbon was wrapped around the Whisper White panel, the sentiment attached to the centre, then the whole piece was attached to the card base, of Pool Party cardstock. I think that this card style could be used for any type of occasion, from birthday to sympathy. The next card we made was using another of my new favourite stamp sets (and I just used it on my Paper Craft Crew design team card); Awesomely Artistic. Judging by the reactions of everyone at the party last night, it’s not just my favourite, now! Since colouring all of the flowers takes a bit more time that we had available, we stamped the flowers in coloured ink, and let their beauty stand alone! Inking up the flower image stamp with Watermelon Wonder, we stamped once in the upper left corner, then re-inked the stamp, and stamped again in the bottom right corner. This gives the effect of the flowers flowing diagonally down the front of the card. Across the middle, we layered a piece of Watermelon Wonder cardstock that had been embossed with the Decorative Dots embossing folder. I had thought to use the Burlap Ribbon next, but on trying it out, I thought it looked to ‘heavy’. So instead, we did this: on top of that is a thinner piece of Tip Top Taupe cardstock, stamped in the same ink colour, using the burlap looking image stamp. What a great way to create the look of extra texture to your card! The sentiment is stamped in Watermelon Wonder ink onto Whisper White cardstock, with the frame around it stamped in Pear Pizzazz ink. The butterfly, from the Papillion Potpourri stamp set, is stamped in So Saffron ink, and punched out using the Elegant Butterfly Punch. 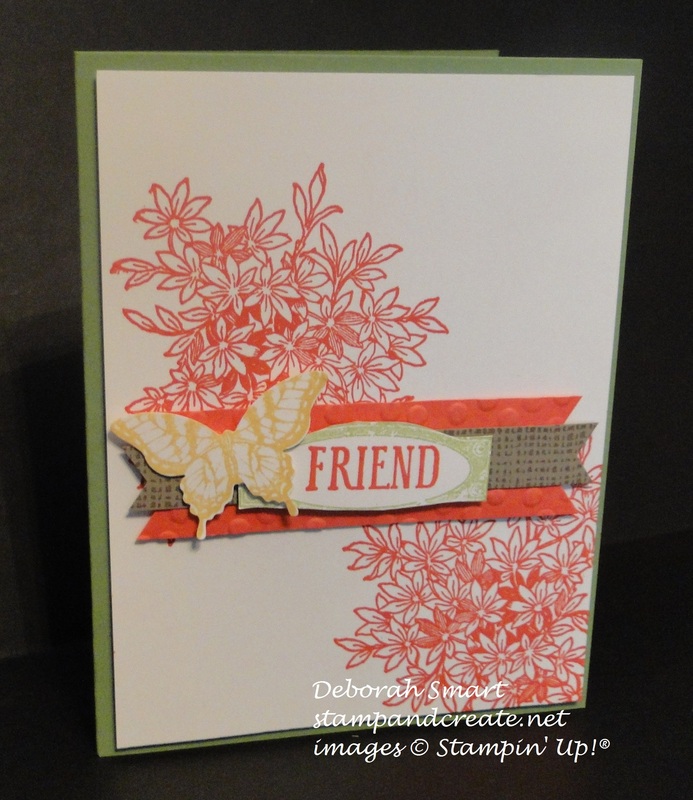 All pieces were layered together using Stampin’ Dimensionals. As I said, everyone had a wonderful time, and were very pleased to be taking home their lovely cards, and of course envelopes. I also gave out door prizes, and of course gifts to my two lovely hostesses. After such a wonderful time last evening, I was quite distressed this morning to find out the one of my hostesses, June, had been taken to the hospital this morning. She is now back home; I did talk to this afternoon, and following up with her own physicians, but please join me in sending best wishes to her for feeling better. Take care, June – rest up, and I’ll talk to you again on Monday! If you are interested in hosting your own Stampin’ Up! party, and earning free hostess dollars, I’d be happy to talk to you, and we can set a date! 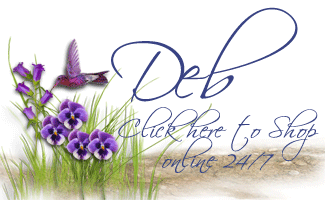 You can call me at 604.298.0472, or email me at debsmart@shaw.ca I’m located in Burnaby, B.C., and service most areas in the Lower Mainland. Next Next post: Deals that are Hotter than the Weather! Love both cards Deb !